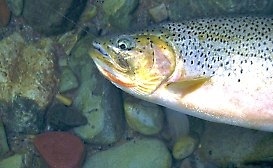 West-Slope cutthroat trout are supposed to be gullible pushovers willing to take any fly that passes by. The little cutty on the upper Elk River in the Kootenays didn't follow the rules. I fished for him for two evenings and one morning with only limited success. The trout rose regularly in the same place next to our camp, and for about four hours fishing I only managed to briefly hook him once. In contrast, I had easily taken dozens of larger trout while drifting more remote sections of the river. The cutthroat obviously wanted only a drag free drift and would only inspect a few of the more than 20 fly patterns I offered him. There was a light hatch of small green stoneflies, three different species of caddis, and two types of mayflies. Due to the rise forms I suspect the trout was selectively taking emerging mayflies, but I can't be sure because I never did catch the trout I eventually called zipperlips. Cutthroat trout with continual exposure to anglers will eventually smarten up and provide a challenge. 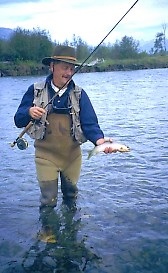 There are cutthroat trout, Bull trout (Dolly Varden) and whitefish in the Elk River. There are also a very few rainbows and eastern brook trout. Some huge suckers may also take the fly, usually a sunken nymph. The river is managed to provide opportunities for all types of anglers. It is divided into sections (usually bridge crossings) with different regulations and restrictions for each section. It is imperative to read and understand the fishing regulations. That is the fascination of this beautiful Rocky Mountain stream; there is something for everyone. The river is a delight for fly fishers who enjoy free rising trout, but there are some huge bull trout that will provide an exciting trophy for the lucky angler who hooks one. Although they should be released, a big bull trout will put up a good tussle on light tackle. Bull trout are predators who prefer large lures or flies. The Elk River starts high in the Rockies adjacent to Peter Loughead Park in Alberta. The river has its beginning in two small, clear lakes appropriately called the Elk Lakes. The lakes require a short hike to reach them. Flowing southward through the Elk Valley the river is joined by numerous small tributaries that swell its volume until it can only be crossed in a few places. 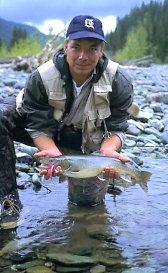 The upper river is strictly catch and release, but that changes at Forsyth Creek, just upstream from Bingay Creek. The catch limit from any part of the river is only one trout over 30 cm, but we've seen that ignored. We noticed considerably fewer fish per pool in the kill sections as opposed to the catch and release areas. And, the fish appeared to be a smaller average size. The kill section extends downstream to Line Creek bridge where it changes to catch and release all the way to Sparwood. Other catch and release sections are from Hosmer bridge to Fernie , and from Morrissey bridge to Elko Dam. Forest Service access roads parallel the upper river on either side, but only come close to it in a few places. It's possible to walk through semi-open forest to the river in a few places. There are several forestry recreation sites on the upper river: Upper Elk, Riverside, Weary Creek, Aldridge Creek, Blue Lake, Krivensky Farm and Round Prairie. Most of the lower river is bordered by private farms and there's little in the way of camping near the river. The Morrissey Bridge rest stop is very noisy due to trains. Highway 3 follows the Elk River all the way from Elko to Sparwood. Beyond Sparwood, a paved highway to Elkford parallels the river on one side while a gravel road follows the river on the other. Much of the upper river can be drifted in small rafts and pontoon boats, but the river is too small for bigger rafts and drift boats. There are lots of sweepers, brush piles and small jambs; some of which have to be portaged around. Downstream from Elkford to the Line Creek bridge there are slow sections with beaver dams. The water from Line Creek Bridge to Sparwood can be drifted, but care must be taken, especially in high water. The river is faster, more confined and the sweepers can be dangerous. It's also more difficult to ford the river in waders because of deep, fast water. Downstream from Sparwood the Elk River is suitable for all types of craft. There are several egress points, with the obvious ones being the bridge crossings at Hosmer, Fernie, Morrissey and Elko. It is about 10 kilometers between each crossing and each section makes a full day's drift. Don't consider drifting below Elko because the canyon section is dangerous. Although drifting the river is a pleasant and rewarding experience, there is lots of water for the casual angler who only wants to walk the river. By late summer and early autumn the Elk can be forded by an experienced wader. However, it can be a long hike between fords. A wading staff can be a help in the faster runs. The bottom is slippery and requires felt bottom boots. Not withstanding the few selective feeding trout, there are lots of gullible cutthroat trout willing to rise to a dryfly. A variety of deerhair caddis patterns are all anyone needs most of the time. I prefer size 14 to 8 hooks, with body colours in order of choice: green, yellow, brown, orange and grey. Size 16 and 14 mayfly imitations in grey, tan and olive are useful. I also like a few emergers for the selective feeders. I'm happy with only a few weighted nymphs. A tan/olive/brown, flashback bead-head in size 14 (Mustad 9671) handles most of my needs, except when the golden stoneflies are hatching in July. Then, I like a size 8 weighted nymph with an olive-brown back and creamy yellow belly. 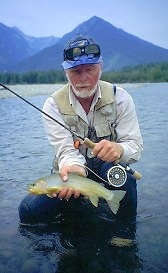 For the huge bull trout I like a size 2 streamer/bucktail that imitates a small whitefish or kokanee . Although guides are not necessary, they do have the equipment for a drift. They have knowledge of the river and provide a return vehicle. I had several excellent days with Mike Labach from Kimberly and we always caught lots of fish.